The difficulty of this dawned upon me when I tried to draw the entire robot at once. I could not seem to figure out, at all, how the body should look. And that was because I had no idea how it was supposed to work. 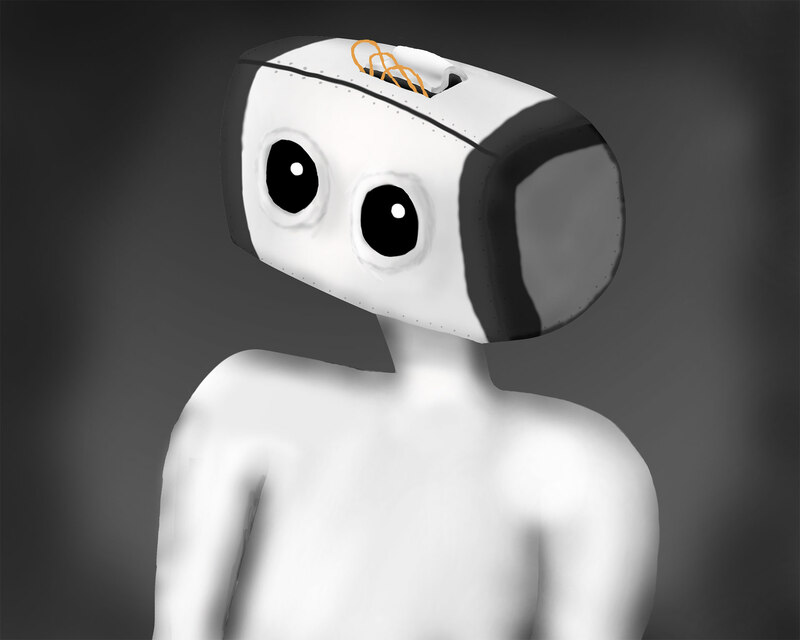 You can see my difficulty with this in the image above from the introduction video, where I made a detailed robot head, but left the body entirely blank. So, instead of just staring at the blank robot body feeling overwhelmed, I have decided to split up the work into a sequence of smaller step, starting with simply deciding which joints are needed and what motions they should be able to perform. That is, deciding in what ways each joint can move. Now, I could just copy the human body, making each joint move just like a person, and it would work just fine, but this is not necessarily what I want. The design should help convey the character, and the Robot is clumsy and insecure. It is sub-optimal for the tasks it has been assigned, and I want it to show in its design. It can do its job, and it does it the best it can, but it was not built for it. It was meant for something else. My idea of how to show this in its movements is to give the Robot a worse freedom of motion compared to a human, impeding the way it can move. Whereas humans can achieve the same basic motion in several different ways, like tilting our head, the robot will only have one way of doing everything, allowing him to do it all, but not necessarily in a delicate way. Hopefully this will reinforce the feeling that the Robot was not built for this, and that it is supposed to do something else. So to make sure that the Robot can do what it needs to be able to, while using fewer axis of motion than a person, I have to decide where on the body it would perform each motion. For example, if he tilts his head, it could be achieved by either the connection between head and neck, or the connection between neck and torso. A subtle difference, but still one of the decisions that has to be made. Hopefully these decisions will also make the construction feel more realistic. After all, a company making robots would want to use as few joints as possible to perform the same tasks in order to reduce cost. So, until the next update, I will work on deciding exactly which joints the robot will have, and in which directions they will be able to move.